Admittedly, I have some personal bias — my great-grandfather was a cattle rancher and used to take me for rides on his rusty old John Deere when I was a child. Rumbling around the property with him always felt like an adventure and was one of the highlights of my childhood. Behind the romanticized idea of rustic self-sufficiency, though, many small farmers struggle. Land and equipment are expensive to maintain, subsidies are limited to a select few commodities and farms, and loans are hard to come by when revenues flatline and assets are fully leveraged. Too often, handing the family business over to the bank or selling it to a large industrial corporation becomes the only option after the toll of weathering market volatility becomes too much to bear alone. The legacy of rugged individualism is just as tangible in entrepreneurship as it is in farming, with equally unfortunate results. Social entrepreneurs are particularly vulnerable to the pitfalls of capitalism, and frequently succumb to what is referred to as “Lone Cowboy Syndrome” in farming communities. Again and again, our businesses collapse under the pressure of remaining independent amidst the turbulence and demands of the global economy. Smart farmers and communities, however, have developed a way to endure and even thrive amidst such precarity via a strategy I call “collective resilience.” Rather than operating as independents, these farmers band together as neighbors and work cooperatively — pooling equipment, tools, resources, labor, etc. — to manage costs and to create and share value. Each family matters to the community and plays a vital role in it. The principle is simple: together we stand a better chance of surviving than on our own. Their resolve and commitment to each other is a powerful symbol of what is right and wrong with capitalism, and the results have proven amazing. In fact, US agriculture co-ops generate in the range of $212 billion annually (source). It’s time for social entrepreneurs to shift our thinking and evolve the design for how we operate and create value to insulate ourselves from volatility and vulnerability the same way farmers do: through collaboration. Capitalism might provide us with the markets to sell our goods and services, but it is indifferent when it comes to our success, our well being, and our communities. This is where COMMON seeks to have an impact — by offering an alternative that runs parallel to the current modus operandi of financial capitalism.This vision lies at the heart of COMMON: A system built on collective resilience where the pursuit of one’s dreams, the aggregation of resources needed to thrive, and the creation of shared value is the focus. We, in essence, become neighbors bound by the community we are part of. It is this sort of collaboration that we generally do not see in business networks because, frankly, each of those independent firms remains a typical corporate animal, chasing profit above all else. As entrepreneurs, we inherited a system that rewards “me first” behaviors and preys upon our fears, and so (even though it doesn’t serve us) we too often default to business as usual, never truly asking how we can do things differently. Don’t get me wrong, I don’t want to devalue all of the effort entrepreneurs put into adopting a social purpose, cleaning up supply chains and building meaningful corporate cultures, etc. These activities are critical, but they still do not address the overarching issue of our capitalist system (wherein the different types of capital are consumed to yield the greatest financial profit for the individual or the individual business and its stakeholders, rather than to create the greatest overall value) and how it plays out in real time. The net effect of this process is a reduction in total available value. It’s why so many entrepreneurs end up drained of resources and exhausted from the endless chase of financial success, and it’s why they ultimately fail — because they deplete the resources they are dependent on to survive, moving from source to source only to repeat the cycle of extraction. Collective resilience represents a powerful alternative to that. Needing a new logo and not having to pay a designer for their services. Working with experts to design a business model at no cost to your team. Being featured in the media thanks to a dedicated team of communications experts who provide assistance without additional fees. Reaping the benefits of shared administrative services and technical infrastructure at a fraction of the typical cost. Co-creating new companies and participating in a shared ownership structure, including hundreds of businesses that function as a long-term investment towards your retirement. Receiving distributions of liquidity (i.e. cash) that you can use to cover basic living expenses. Gaining access to additional opportunities for yourself and your business as a direct result of providing help to others. Consider what this would unlock, how it would accelerate success and the many different forms of value it would create for the community. It’s all doable right now. In fact, within a week, the size of the COMMON community could go from 200+ social businesses to hundreds more, and in that short time could begin delivering on some of those possibilities. Imagine the momentum that would build. As in the case of farmers who come together as neighbors, growing our community would also insulate us from uncertainty and help more of us through the ups and downs of progressing from one stage of business to another. Now for the tough part. In order to establish this alternative, social entrepreneurs must commit to a new type of accountability for everyone’s success. We cannot hand off that function. It must be transmitted from person to person, human to human. 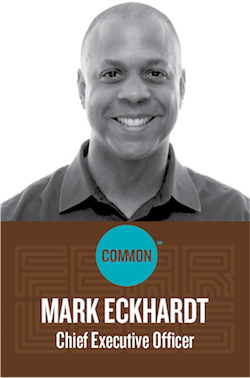 For COMMON, the choice is to mobilize as a community and be the collective change in the world that we have pledged to be or to tacitly accept that we’ll grind on, making small, incremental steps instead of the transformational leaps that will ensure that more within our community thrive, do the work they are meant to do and are better protected from volatility. Here’s the good news: Making that initial leap might not be as difficult as it seems. It is just a matter of committing to collective resilience — i.e. doing what the smart farmers do. And here’s what that will look like in real time. Each member commits to inviting one person to join COMMON and to supporting them in being successful as a member once they do. We shift how we relate to COMMON from paying a membership fee to a being a co-investor in a powerful alternative to business as usual. To this end, every member prioritizes a small amount of time each week to be active within the community and to offer assistance to a fellow COMMONer once per month. Upon achieving 400 active members, COMMON will begin to add key staff to provide free services such as design, research, etc. — exact services will be determined based on member feedback and need. We will also initiate a profit sharing program where at least 15% of net profits will be distributed to those who maintain their commitment, and at 800 members, we’ll increase the percentage of sharing net profits to a maximum of 20%. The ultimate goal is to distribute all profits from our collective activities back to the community. At COMMON, we’ve committed to actively building our community on these principles. We believe these small changes will give us the collective resilience we need to weather the storm of capitalism and to maximize value both to our community and to the world as a whole. The future is ours to write, and it begins now. Join us. To learn more about COMMON and Collect Resilience sign up for a webinar on Oct 23rd or 25th, 2018.